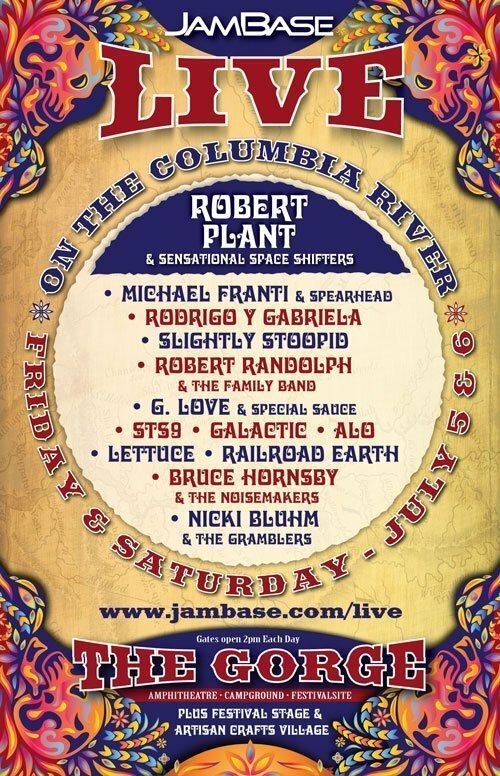 Today, popular online jamband magazine, JamBase, announced its first festival and an all-star jamband lineup. The festival will take place at the The Gorge, a famous outdoor venue in Washington over July 4th weekend. Robert Plant & Sensational Space Shifters will headline the event. Other artists on the roster for the 2 day festival include Rodrigo y Gabriela, Slightly Stoopid, Michael Franti & Spearhead, Robert Randolph & The Family Band, G. Love & Special Sauce, STS9, Galactic, Railroad Earth, Bruce Hornsby & The Noisemakers, Lettuce, Nicki Bluhm & The Gramblers and ALO, along with a local stage featuring regional acts. Tickets to JamBase Live are $75 and will be on sale March 16 through LiveNation. Over the first weekend of sales there will be an early bird discount. For more info check out the festival website.